New book, 80 pages. This second volume in the Israeli Wild and Cruel Cats series covers the tank-based combat engineering vehicles and armored personnel carriers in service with the Israeli Defense Force. 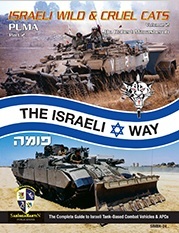 Authored by Dr. Robert Manasherob, a world recognized expert on Israeli military vehicles, this volume contains detailed descriptions of the later developments of PUMA combat engineering vehicles equipped with different engineering devices and systems such as "Ritzuf" (carpet), "Magov" (Mine plow), "Norchri" (Mine roller), "Dahpor" (Dozer) and "Tzefa" (Viper). 80 pages in full color; More than 180 color photos; Dozens of unique and previously unpublished photos; In-action photos; Interior detail photos; Walkaround photos; 1/35 scale drawings; Detailed color profiles; Never before seen tactical markings. This item was added to our catalog on Monday 02 October, 2017.